The rotationally moulded cabinet trolley is ideal for construction sites or industrial areas where you want to protect your fire fighting extinguishers. 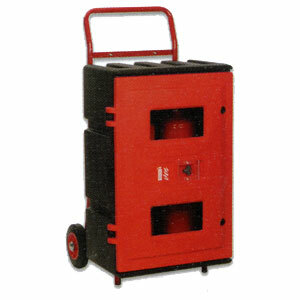 Designed to hold 2 to 3 9kg or 9 litre fire extinguishers securely. Features a triangular keylock and keybox. Manufactured from chemical resistant, high-impact resistant plastic. Polycarbonate vision panels in door. *Fire extinguishers pictured are not included.